Calatus Cave for small rodents! 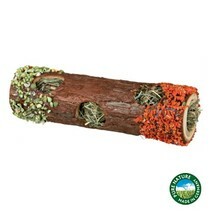 The Calatus tree trunk snack cave is made of natural birch wood filled with hay. The roof is detachable. The roof has an opening with a mix of seeds, dried carrot, oats, wheat and herbs.